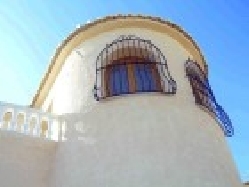 VILLAS AND APARTMENTS TO RENT IN BENITACHELL, SPAIN. Welcome to our selection of holiday homes to rent in Benitachell, Spain. Benitachell is a small friendly village upon tall cliffs in the north end of Costa Blanca that is bountiful in colour, character and places to just relax in peace enjoying the beautiful views. The height of the summer months are it�s hottest while it is quite mild the rest of the year so it is best to go during July or August. Originally an Arab outpost, Benitachell is laid-back, everyone living their lives there at a slow pace just enjoying the sun and perhaps a tapas at lunchtime in one of the lovely little restaurants or cafes amongst friends or family. Because of its location right by the sea, seafood is quite common on menus here although Benitchell is not a dedicated fishing village, however there are also several international places to suit a tourists personal taste. The Playa del Moraig is Benitachell's secluded beach with more family friendly beaches close by on its stunning coastline. The Playa del los Tiestos is a small-secluded beach that can only be reached by boat. Although Benitachell is a very pleasant town, visitors staying here may wish to travel to other places nearby so a hire car is recommended. There are several locations of interest around with several urbanisations such as Cumbre del Sol. Benitachell is roughly an hour�s drive away from Alicante airport. Looking for self catering holiday accommodation in Benitachell? Then below is a selection of apartments in Benitachell and villas in Benitachell that can be rented direct from their owners. You can either click on each listing for further details or you can use our search engine on the left if you are looking for something in particular.